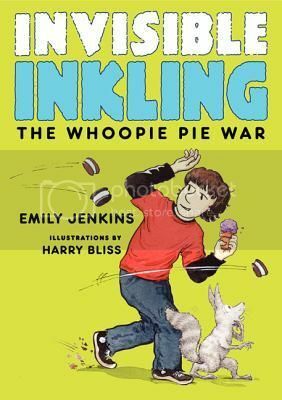 Hapless fourth-grade Brooklynite Hank Wolowitz and his invisible pet bandapat named Inkling return in this gently humorous realistic fiction, with just a touch of fantasy elements. Although Inkling is an unreliable narrator with a sometimes distant relationship to the truth, readers will accept that he is invisible, not imaginary. In addition to managing the demands of his often cranky, but always funny invisible friend, Hank also navigates complicated school friendships, swimming lessons where he copes with the embarrassment of being ranked a "Neon" (the lowest level) and most importantly, dealing with the mean-tempered food truck lady whose cheap, non-organic treats threaten the success of his family's boutique ice cream shop. Pumpkin is one of Inkling’s favorite foods, yet Hank finds himself agreeing to "splat" his hard-won canned pumpkin out the window in order to impress popular kid Joe Patne. Hank also discovers that water renders Inkling visible and is finally able to focus on improving his swimming technique. A diverse cast of characters and believable middle-class urban setting make this tale of the value of true friendship very relatable without being didactic.